Maximum 6 per group guaranteed, kids will have fun whilst progressing safely. 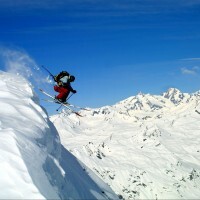 Do you need to get your confidence back on the snow, do you want to discover the quiet Espace Killy pistes? Our instructors will look after you. Do you want to find deep powder turns in secret Espace Killy spots? Our guides will take you. 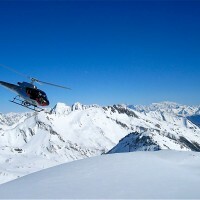 Pick up from the banks of the Chevril lake or drop off on Italian summits, heli-skiing is easy to organise in Tignes. Originally a quiet mountain village nested on the Isère valley, Tignes became best known as a ski resort. In 1952, the original village of Tignes was drowned following the governement’s decision to built a hydroelectric dam despite local opposition; a ski resort was then developped at the higher lake of Tignes Le Lac, surrounded by perfect slopes and crowned by the 3,650 meter high Grand Motte glacier. 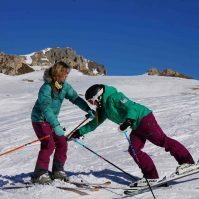 Together with nearby Val d’Isere, it forms the Espace Killy ski area, one of the largest of the world with its 10,000 hectares and 300 km of runs, which attracts skiers from all over the world looking for both groomed slopes and endless off-piste skiing possibilities. Tignes was the freestyle skiing venue for the 1992 Winter Olympics. More recently, Tignes has been hosting the winter european Xgame and the tour de France during the summer, confirming the sportive charachter of the resort. Since 2010, Tignes is equipped with modern sports infrastructures like Tignespace, an indoor sports facility and Congress Centre and the Lagon, a fitness, swimming pool and wellness centre. Tignes is composed of 5 villages with different atmospheres- from the high altitude modern resorts of Tignes Val Claret, Tignes Le Lac, Tignes Lavachet to the mountain villages of Tignes 1850/ Les Boisses and Les Brévières. A free shuttle service operates between them. Good transport links Tignes in and out of Lyon, Geneva and Chambery.